The future of CX is looking very exciting. There’s more technology than ever before and yet there’s more problems and customer dissatisfaction than ever before. Here’s the key problems we hear from clients and see in the work place. Products or services not 'hitting the mark' of what customers want. Not knowing what to create next for the customer. Not knowing the customer touch points that create either a detractor or fan of a product or service. Time for customer service response. Identifying new as yet uncapitalised areas to create ideas that increase delight, experience and increase sales. As much as we love technology at Ideas with Legs, we know that investing in it without having the right CX innovation will result in a big expenditure with little return. Recently I had a trying customer experience with a major telco. We had a couple of mobile numbers from previous staff that we were no longer using and we wanted to drop those accounts. Fairly simple request, yet the telco made it a painful, frustrating and time wasting experience. Despite having some of the most advanced chat bots on the market and every supposed help guide for you to fix it yourself, none existed for this particular issue. Which meant the trusted phone was the way to deal with it. I had six phone transfers from a call made to their central support centre and a painful forty minutes later the problem was solved. I resolved to change our company account to another provider. What the telco had failed to do was to map out CX touch-points, nor had they any plans for a service recovery from the obvious time wasting. Customer experience and customer service plays a big role in customer retention and customer attraction. The typical response from typical organisations is to increase marketing expenditure to deal with the ‘churn & burn’ that happens as a result of customer experience. Discovering customer insights makes commercial sense for a number of reasons including being able to engineer remarkable customer experience, creating clarity around touch-points and creating ideas for improving them and let's not forget increased referrals and increased sales. Customer constraints - what constraints the customer faces, time, knowledge, accessibility etc. If you’re not designing the experience that you want your customer to have, by mapping out wish one of those touch points step by step then you can be guaranteed that there will be an ugly customer experience lurking in there. Touch point mapping isn’t rocket science, but it takes a bit of time and it reveals issues that need fixing which is why people avoid doing it. 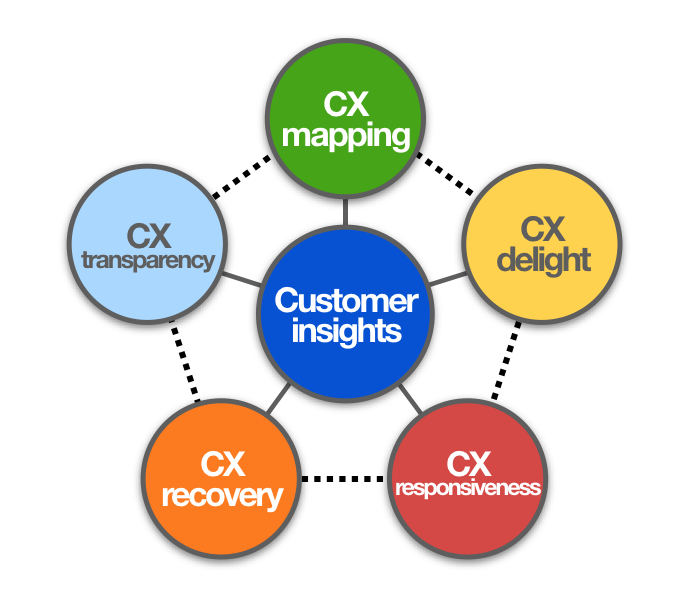 Fail to map out the CX touch-points and you risk losing sales, losing customers, loyalty and increasing expenditure. The simplest way to map out touch points is to do a story board. Here's 7 ways to storyboard anything in your business. 6.	Review your story board, could the experience be any better? If yes, do you need to add any more frames? 7. Do you need to add anymore detail to the elements or flow? If so add another frame. Customer expectations have changed dramatically in the last 7 years. Customers want it instantly and they want it seamlessly. 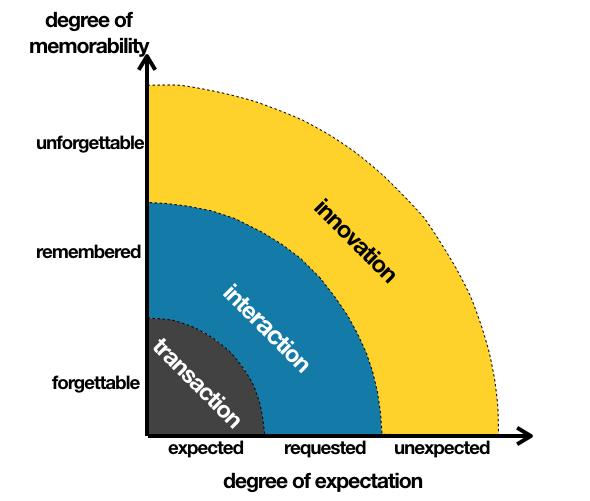 If however, we deliver just what a customer expected (just like any other provider) then we become forgettable. If we deliver an extra component to match a request we will be remembered. Yet when we can deliver a value add that is unexpected that’s when we become unforgettable to them and create a raving fan for life. To engineer CX delight run an ideation session with the following parameters. Generate ideas as to when and where we can provide an unexpected value add or element of surprise. For example after an invoice is paid, after a client has signed up, an anniversary date etc. Make sure the ideas are relevant, fun, memorable, meaningful and inexpensive. Revisit & redesign the touch point map - if something went wrong, the process is broken. Take the time to review your touch point map and improve it so that the issue doesn’t happen again. People hate it when people deny there’s an issue or pretend it’s not their fault. Fess up fast, and acknowledge that your organisation has made a mistake and clearly articulate what you’ll be doing to rectify the existing problem and the steps you’ll be taking to prevent it in the future. Once you’ve got some of these critical customer experience components on your radar the you can consider the CX technology that’s coming. 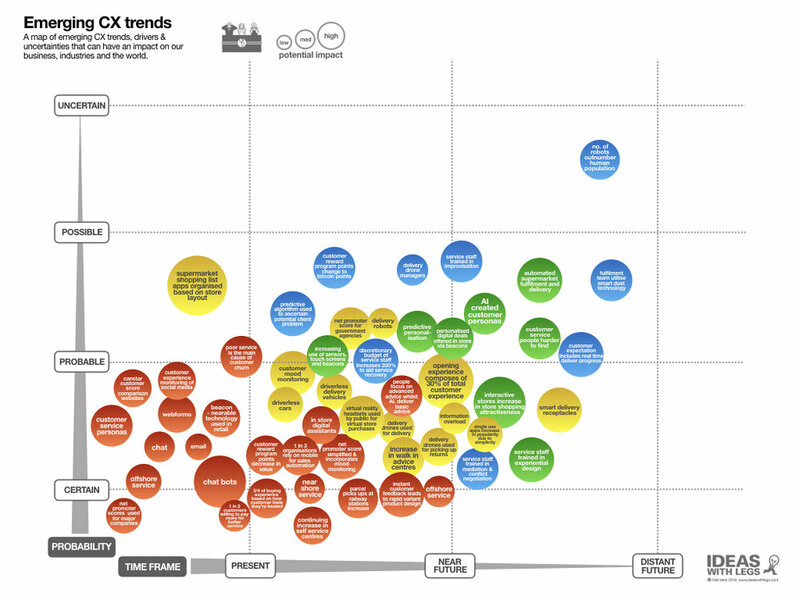 In the Emerging CX trends chart we constructed we have identified what’s already happening and what’ going to be coming your way in the future. If you’ve got the CX innovation principles covered then by all means start to think more of the technology that can help streamline some of your CX activities. We love innovative CX. We help organisations with teams just like yours who can be going round in circles trying to establish what a client really wants or needs from the next product service that will wow them and woo them to purchase more than ever. We also know how to eliminate those pain points. We recently worked with a products team consisting of designers, marketers and sales people and increased the no. of commercial insights being generated by 280% in 12months resulting in a 105% increase in new products with commercial patents being granted. If you’d like to improve your CX innovation we’re here to help.